Superman (Henry Cavill), Joker (Heath Ledger) and Batman (Christian Bale) playing poker. This week's caption comes from funnypicturesplus.com. Here's mine: "Everyone knew the Joker's always wild." 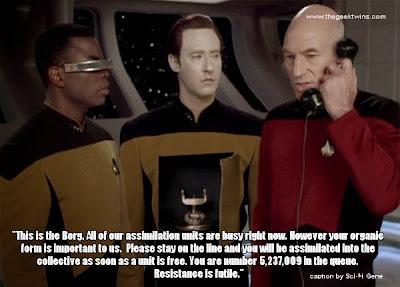 The captions two weeks ago for "STAR TREK Captain Picard's New Mobile Phone" were priceless, but the winner is Sci-Fi Gene! I don't want to keep harping on voting for your own comment so VOTE FOR YOUR COMMENT! It's not cheating and makes a level playing field. What caption would you give this picture? Which caption is your favorite? Let's all agree right now that it's not strip poker. Let me tell you something, Superman, Batman, in this game the Joker is wild. Batman: Date Knight is just not the same... since the women left! Superman: That is just super! "You could say I know Batman better than you ever did." "Mind if I take this?" Superman: "Is he always like this?" Batman: "Oh, you have no idea." Batman to Joker: "Are you sure these cards are lead lined"
Joker to Batman: "You oughta know, you bought them." Superman to all: "Guys you should know I would never cheat"
Joker to Superman:" Thats not what I heard from Lois after that Wonder Woman fling." What do you mean you forgot the dip? "Lois, has this friend, real nice personality!"